It may be the end for Batman and Robin. They're magnetically trapped on a buoy out in the water, and a deadly torpedo is approaching quickly. From their nearby sub, four super-villains rejoice in apparent victory over the Dynamic Duo. An explosion occurs, but somehow they manage to escape on the Bat Boat unscathed. How has this happened? It seems that a porpoise has sacrificed itself to save these honorable crime fighters. In total seriousness, Batman exclaims, "It was noble of that animal to hurl himself in the path of that final torpedo. He gave his life for ours." This is classic high camp, and epitomizes the allure of Batman: The Movie. In this silly feature film, Batman and Robin must once again save the world from evil with the aid of ridiculousness and bad puns. The Caped Crusader and his exuberant, faithful sidekick must battle the combined forces of four of the most memorable villains in the series. A maniacal, quacking genius, the Penguin (Burgess Meredith, later of the Rocky films) devises crazy schemes to take over the world. The thin, eerie Riddler (Frank Gorshin) creates awful puzzles for the duo to solve. With a face covered in white makeup, the Joker (Cesar Romero) laughs his way through numerous deadly ideas. Finally, the stunning Catwoman (Lee Meriwether) lures Bruce Wayne into a trap utilizing her substantial charms. With these four enemies working together, the future appears bleak for Batman and Robin. The Penguin has created a plan to kidnap the top world leaders using a dehydrating device. With all of their lives in the balance, the courageous heroes must race to save the day and defeat this ingenious scheme. In probably the funniest scene in the film, Batman rushes around a Gotham City pier trying to dispose of a lit bomb. While holding the black ball in a ludicrous manner above his head, in hilarious succession, nuns, a marching band, lovers on a boat, a baby, and other innocent bystanders become obstacles that block him from throwing it away. This scene represents a prime example of the allure of the television series and this silly movie. Adam West keeps a straight face, even while uttering the punch line above, and this adds to the success of this humor. Commissioner Gordon: What weighs six ounces, sits in a tree, and is very dangerous? Robin: "A sparrow with a machine gun!" In all honesty, Batman: the Movie is a stupid film. Its story is utterly absurd, and the quality of acting (especially from the two leads) is pretty wooden. However, these normally negative qualities actually contribute to its success and entertainment value. 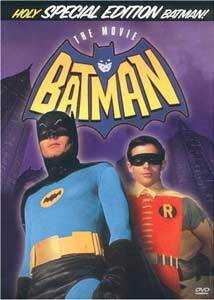 Adam West and Burt Ward work as Batman and Robin because they're able to play the scenes straight and take them with ultimate seriousness. West often speaks like he's doing Shakespeare, especially in his groan-inducing date with Catwoman's alter ego�Miss Kitka. Ward delivers his lines with such a boyish enthusiasm that it's easy to ignore his simple mannerisms. For example, in dealing with the Riddler's outlandish puzzles, both characters speak them with total seriousness. If they would have used a mocking, in-on-the-joke approach like in Joel Schumacher's horrible Batman and Robin, the story would have failed completely. Robin: Let's commandeer a taxi! Batman:No Robin. Not at this time of day. Luckily we're in tip-top condition. It'll be faster if we run. Let's go! Utilizing a larger budget, this film was able to include more action scenes that moved beyond the simple fist fight. The Dynamic Duo now can use the Bat Boat, the Bat Copter, and the Bat Cycle. Still, the best moments retain the cheap nature of the television series. While racing to halt the kidnapping, Batman and Robin dash through the streets in the middle of traffic. This effect works due to its simplicity and plain preposterous nature. Another favorite is the wall climb, which obviously is achieved by simply rotating the camera 90 degrees. In reality, the actors are just walking straight across a floor designed to resemble the sheer wall of a building. Of course, the final battle includes the show's trademark exclamations like "splatt!" and "ouch!" These goofy statements are another example of the camp that drives this film�a dumb, yet endearing story of nearly constant absurdity. Image Transfer Review: Batman: The Movie's 1.85:1 widescreen transfer improves greatly over the poor picture seen when played on television, but it still suffers from the limitations of the time period. Although filled with bright colors, they have a muted, bleached-out look that stems from its dated source material. A few specks of dirt appear that probably existed on the original print, but they're not too distracting. Although this transfer lacks a high level of clarity and sharpness, this does fit with the camp of the television series. Unlike the recent big-budget film releases, it doesn't go for the pristine, high-tech look. Overall, this transfer works in keeping things enjoyable, but it lacks anything special in terms of color or focus. Audio Transfer Review: The new stereo audio transfer on this disc includes an effective balance between the speakers and a decent amount of force. Similar to the visuals, however, it's complexity can only go so far due to the limits of its original track. The sound echoes strongly from the speakers, but little exists beyond the prominent sounds. While the theme has an energetic ring to it and still packs a punch, the overall transfer lacks the depth necessary for a memorable transfer. This disc also contains a mono track that suffers from the same problems as the stereo version. It has a bit less punch than its companion, and has even less variety in terms of the sounds emitted. Extras Review: Holy interactive menus Batman! The presentation for this DVD perfectly mirrors the silly tone of the film. This sense of fun also comes across in the feature-length commentary by Adam West and Burt Ward, who play Batman and Robin. Both of them crack a lot of jokes during the track, and obviously enjoy the other's company. They focus on all types of subjects and inject humor into everything said. While none of the material is fascinating, the entertainment value is high throughout the entire film. Fans will get a kick out of hearing these guys reminisce on the production. Another interesting bonus is a new, 16-minute featurette mostly composed of interviews with West and Ward. It's odd to see them 35 years after the movie as older men. Since Ward was much younger, he's changed dramatically, but he still displays a boyish enthusiasm for the show. Both stars speak on a wide array of topics and are very forthright about the show and their roles. They appear to have really enjoyed filming the show, and have virtually no regrets about the experience. This feature contains plenty of fun tidbits and is enjoyable throughout its short running time. Batmobile Revealed is a six-minute interview with George Barris�the designer and builder of the famous vehicle for the television series. He expresses plenty of enthusiasm for the series and his role in creating the Batmobile. They actually built five cars for different aspects of the show. Each car weighs 6,000 pounds, and is an experimental Lincoln Futura. Model cars were also utilized when it was possible. Barris joyously provides loads of information in this short running time, and his enjoyment makes this piece more interesting than the actual material conveyed. The remaining supplements cover the marketing materials for the film, including two still galleries and several theatrical trailers. From the Vaults of Adam West contains mostly black-and-white photographs from behind the scenes that focus mostly on West in and out of costume. This section also has some fun photos of the other actors goofing around during the production. The other still gallery contains a shorter collection of color pictures shot behind the scenes and between takes. There are also several publicity posters from the time of its release. The original theatrical trailer provides a lengthy glimpse at many of the essential scenes throughout the film. Batman and Robin appear at the beginning and introduce their foray onto the big screen. It appears in a mediocre TV-quality transfer that utilizes the full frame. The Spanish trailer is the exact same in terms of content, but it also includes subtitles and narration in Spanish. Oddly, this preview comes in an improved widescreen format. The teaser begins in a similar vein to the trailer, but it contains only a few shots of the villains instead of the longer scenes. It also comes in a good widescreen transfer. Finally, there's a brief full-frame trailer for the Planet of the Apes DVD collection. A far cry from the dark, gothic creation of Tim Burton, Batman: the Movie works because it's purposely ridiculous and funny. Shot in the midst of the series' popularity, this story takes the best elements of the show and expands the budget and scope. Even though it falls flat at times and features plenty of poor acting, the pure enjoyment in its creation shines through. With a score of hilarious moments, this film provides lots of good-natured fun and entertainment to the very end.